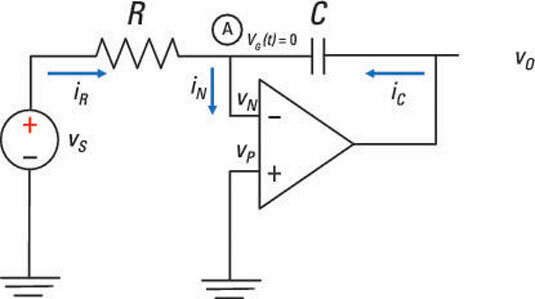 By adding a capacitor to an operational-amplifier (op amp) circuit, you can use the op amp circuit to do more-complex mathematical operations, like integration and differentiation. Practically speaking, you use capacitors instead of inductors because inductors are usually bulkier than capacitors. 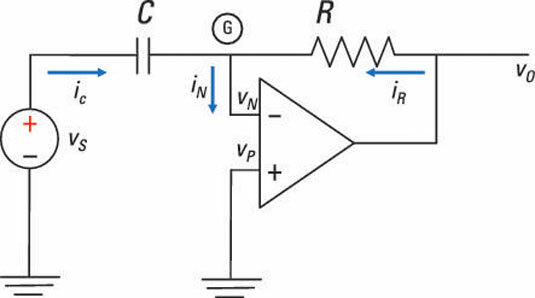 Here is an op amp circuit that has a feedback element as a capacitor. The circuit is configured similarly to an inverting amplifier. The cool thing about this op amp circuit is that it performs integration. The circuit electronically calculates the integral of any input voltage, which is a lot simpler (and less painful!) than banging your head on the table as you try to integrate a weird function by hand. The op amp circuit accepts an input voltage and gives you an inverted output that’s proportional to the integral of the input voltage. With op amp circuits where the resistor is the feedback element and the capacitor is the input device (like the one shown here), you can perform differentiation electronically. So if you are given an input voltage, you won’t even raise a sweat in getting its derivative as an output. The inverted output is simply proportional to the derivative of the input voltage.